This Chicago Cubs ended the 108 year wait by winning the 2016 World Series. Big Time Bats has released a limited number of White W bats signed by Relief Pitcher and bullpen Ace Mike Montgomery. The bats feature the iconic Blue W, the words "2016 World Series Champions," and all of the highlights of the 2016 season, including final Regular Season record, All-Stars, batting leaders, pitching leaders, and MVP award winners. Mike Montgomery signed each bat, which is fully authenticated by MLB Authentics. Montgomery joined the Cubs mid season as part of a trade with the Mariners, and proved to be a very reliable left-handed reliever during the latter part of the regular season and throughout the playoffs. Mike earned his first career save by closing out the Indians in the bottom of the 10th inning in the decisive Game 7 of the World Series. 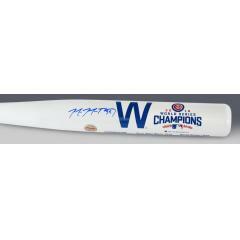 Mike Montgomery Signed Cubs 2016 World Series Champs "W" Bat $295.00 Sold Out!